Select Endcap Type Endcaps used for hanging with hooks, wire or rope. Endcaps used for standing on a glass surface, such as aquarium lid. Endcaps used for flush mounting to an aquarium hood or the underside of a shelf. This is a brand new heat sink, specifically designed and precision built in the USA. The first ultra-high power passive (fan-less) heastink. We call it the HD (High Density) heatsink. This thing is a BEAST! Steve's LEDs has created the first heatsink that can handle as many LEDs as you can fit on it without using a fan! When you don't have a fan to blow air across a heatsink, you rely heavily on a large surface area. A 12" length of this heatsink has over 2 square feet of surface area! This means that you can stack LEDs end to end across the entire length of the heatsink, and it still won't overheat. For even closer spacing, use our PARMAX LED array boards. Beware of other LED heat sinks that do not post the specifications - those have strict limits on how many LEDs you can put on them, and they run HOT with only a few LEDs. Ours have been tested to 50W of LEDs per foot! That is about 16X 3W LEDs in a one foot length. The HD heatsink is designed to run as cool as possible. It includes a splash shield and it is easy to seal the LEDs in creating, a IP66 compliant light fixture. It can be set directly on a glass top, suspended, or flush mounted to the ceiling of your hood. This heatsink allows your DIY design to look 100% professional, and run 100% silently. No additional power adapters, brackets or accessories are required to mount a fan because it doesn't need one. Yet, you can have just as many LEDs as an equivalent size heatsink that has a fan. Unique screw channel design eliminates the frustrating and time consuming T-Slot and nut mounting systems. All you need is two of our #6 stainless mounting screws and insulating washers, a screwdriver and a 10 seconds of your time to get an LED mounted securely. LEDs also requires thermal paste for maximum performance. This heat sinks accept any LED that has outer dimensions smaller than 1.60" - which is large enough for standard 20mm stars, array boards, Luxeon M Squares, and many COB LEDs currently available. 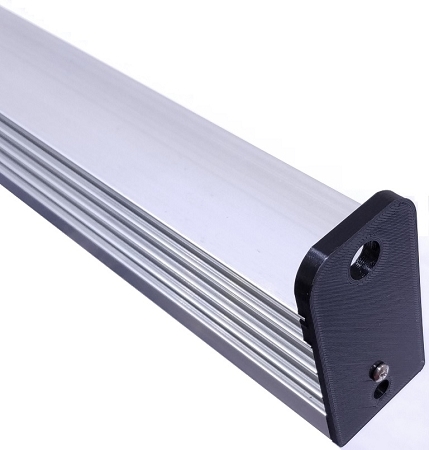 One of the best features is that this is a linear heatsink providing even light distribution and eliminating hotspots! Don't group your LEDs together in a cluster, that does not distribute light evenly. 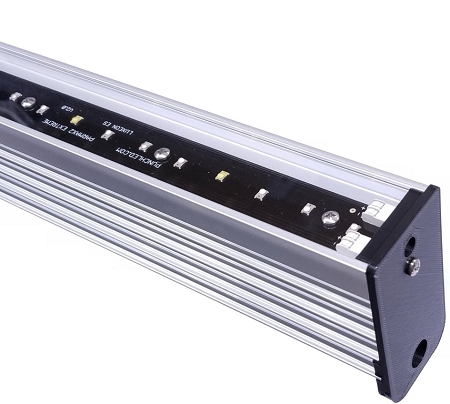 This linear heatsink provides superior light blending and distribution for maximum growth. 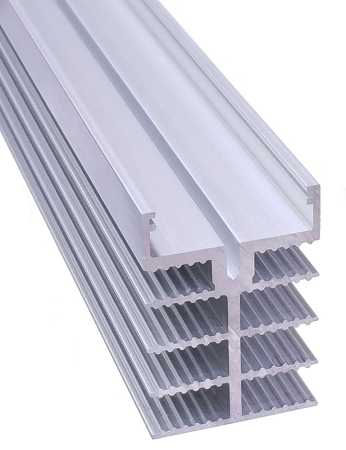 This heastink comes in ~12 inch increments, up to a maximum length of 48". This heastink can be cut to size to fit your exact specifications - no extra charge for this. For example - if you need a 22" length, please order a 24" length, and specify for it to be cut to 22". Thermal dissipation capacity - We have tested up to 50 Watts of LEDs per foot, with the temperature below LED manufacturer's recommended max temp (lower is better!). The metal part of the heatsink is cut about 0.5" shorter than indicated to accommodate the width of the end-caps. Complete fixture width including endcaps is the listed width. We inform you of this to ensure that your LEDs mounted inside will fit appropriately. Weight is 1.22lb/ft, or 4.89 lbs per 48" length! Cut tolerance is ± 0.75in (19mm) max.